Upma is a popular and healthy Indian breakfast recipe originated from the south India as Uppittu. The main ingredient in Upma is Suji (rava), there are many version this south Indian recipe available like vegetable upma, chesse upma, Bread Upma and many more. Read the complete recipe of this delicious and yummy Upma Recipe below. 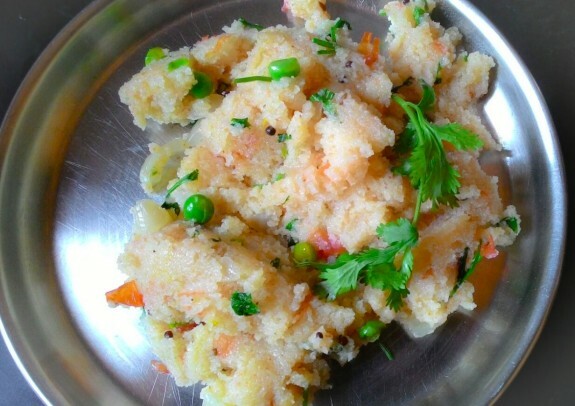 How to make vegetable Upma? Take 2 tsp oil in the same pan, add chopped onions and green chilies and mix it until it turns it Brown. Now add chopped tomato and cook it for a minute. Add 2 1/2 cup water and bring it to boil, add salt in it. Now add roasted suji and mix it and cook it for 5 min on. low flame. Upma is ready to serve garnish it with dry fruits, lemon slice, raisins and Coriander leaves.